HM Coastguard Fleetwood said it was paged shortly before 10.15pm on Saturday to support Lancashire Police following reports of a distressed person who was refusing to come out of the water. 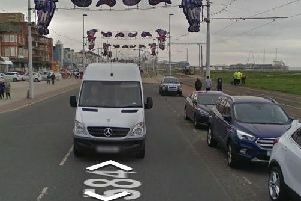 The team reported the incident - near The Venue, Cleveleys - on its Facebook page. It said: "On arrival at the scene, it was quickly obvious that the person was not willing to negotiate and move into a safe area. "Two coastguard rescue officers quickly donned dry suits and PFD’s (personal flotation devices) and prepared to enter the water should events take a turn for the worse. "Our flank team HM Coastguard Lytham also attended the scene to assist while we waited for RNLI Blackpool to reach the scene with both ILB’s to provide safety cover. "Once all resources were in position, the two CRO’s (one from Lytham and one from Fleetwood) entered the water and engaged in further discussions with the person while RNLi crews also approached the casualty from behind. "Despite a prolonged discussions with police and coastguard, it was decided to assist the casualty out of the water and into the care of the police, who escorted them into a warm, waiting ambulance from North West Ambulance Service. "A great result with a successful outcome for all concerned showing excellent team working. "Many thanks to all agencies including our CG Operations Centre in Holyhead for the support during this prolonged incident." Meanwhile, the team said it was also paged just before 12.15am on Saturday, as a person could have possibly been in the water at Central Pier, Blackpool. Both Fleetwood and Lytham Coastguard attended the Central Beach area following reports of shouting about a person in the water. Following extensive shoreline searches and water searches by RNLI Blackpoo,l who launched two inshore lifeboats, nothing was found and the operation was about to be stood down. Fleetwood Coastguard said: "However, one of the search teams came across a distressed person and made themselves known to this person. "Once they had assessed the situation, this unknown casualty was passed to the care of Blackpool Police. "We had been stood down and getting in our cars when a keen eyed Fleetwood 4 spotted another person whose demeanour just didn’t look right. "Once again we ensured this person left the beach area before we left the area ourselves and headed back to our beds." But then at 7.10am yesterday, the team responded to another ' possible person in the water' in the South Shore area. "Again both ourselves and HM Coastguard Lytham where paged after a member of the public had spoken to a person who was in a distressed state," said the team. "Another extensive search of the area with nothing found. "In both cases, these where false calls with good intent. "With thanks to all those volunteers from the RNLI Blackpool and Lytham Coastguard along with police officers from Lancashire Police."